G. Harvey painted Snowy Tracks, an exciting Denver scene, after a trip to Colorado. 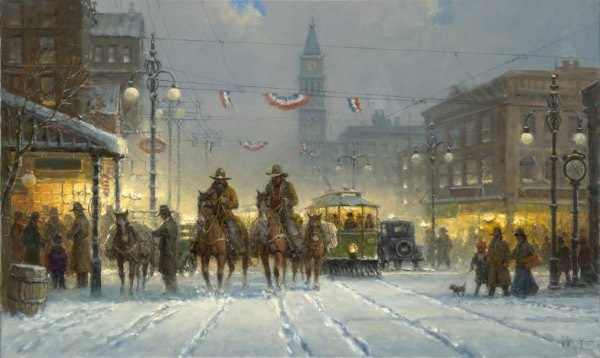 He has captured the excitement of Denver in its early years with this scene featuring the D & F Tower and bustling activity on Laramie Street. Snowy Tracks copyright© 2006 by G. Harvey is prohibited from being copied. G. Harvey art, western, oil well, texas oil wells, cowboys, texas, artwork, art work, canvases, images, paintings, pictures, and prints of Snowy Tracks by artist G. Harvey for sale. Snowy Tracks painting by artist G. Harvey can be purchased in art print or canvas form at special sale prices at Christ-Centered Art.